Thank you for taking the time to visit my website. Diolch am edrych dros y wefan. Si desea saber más sobre mi trabajo, puede ponerse en contacto conmigo. “A mighty read this, I feel bereft now that I’ve finished it, always a sign of a writer who can fascinate and engross the reader over 500 pages or so. This novel has at its heart the Chilean civil war – who knew? Not me. It is also inspired by the life and exploits of the author’s great great uncle, a Welsh lad who ran away to sea and became the captain of a steamship carrying mail and cargo up and down the Chilean coast in the latter years of the 19th Century. Forced to turn his ship over to the government side in the insurrection he then carried troops and ammunition, facing all the usual moral quandaries of loyalty and betrayal amongst his colleagues and shipmates as well as the horrors of engagement. Other strands of the story are deftly woven in to the complex tapestry of events and provide richness and increased understanding of the pressures involved. Parliamentary questions are asked about the danger to British commercial interests in Chilean minerals and an English journalist dispatched by The Times to report on the rebellion finds that the ‘facts’ required by his editor do not match up to the facts he finds on the ground in Valparaiso. It’s a bit like buses. With the help of my fantastic publisher, Consuelo Rivera-Fuentes at Victorina Press, I published, ‘My Beautiful Imperial’ in December 2017, then the Spanish translation, ‘Mi Querido Imperial’ in December 2018. In between, I came 3rd in the Hammond House International Short Story, with a story called ‘At a Junction’, which was published in their anthology, ‘Eternal’. In October, another shortlisted short story, ‘The Significance of Swans’, was published in the Bristol Short Story Prize anthology. One of my proudest moments this year was seeing ‘My Beautiful Imperial’ being included on the Walter Scott Prize Academy’s list of recommended historical novels for 2018. “A framed set of etchings and an old photograph album were almost all I had to go on when I began my research 20 years ago. Once I started, I was hooked. At every turn, the story became more incredible,” Rhiannon Lewis says in her epilogue to this novel, based on real people and events. And what a story she’s written. It tells of David Jefferson Davis, ‘Davy,’ a young farmer living in rural Wales in the 1860s whose family life is suddenly torn apart by a tragic incident involving the death of his little sister Elen for which he is mistakenly blamed. Forced to leave home and following in the steps of his father and grandfather before him, Davy embarks on a career at sea that eventually takes him all over the world. Through hard work, persistence and his desire to command people, Davy manages to gain the captaincy of the Imperial, built in Birkenhead, and considered one the finest mailboats of its time. Aboard the mighty ship, Davy travels to Chile in the 1890s and, without warning, suddenly becomes embroiled in the bloody Chilean civil war, during which the majority of ships deserted president Jose Manuel Balmaceda’s navy. The British vessel takes part in the dangerous task of loading and transporting thousands of Chilean government troops, as well as horses and ammunition, while attempting to evade the constant attacks of the rebels’ ships in pursuit. My Beautiful Imperial is a wonderfully epic story of friendship, unfulfilled love, human tragedy, war and Latin American politics that grips from the very beginning. It’s an exhilarating journey from the poorest parts of rural Wales to the Houses of Parliament at the height of imperialist Victorian London, from Australia as a new immigrant destination to Buenos Aires, from the perils of crossing the Andes to busy Valparaiso harbour and beyond. The book is based on actual events that tore Chile apart at the end of the 19th century and were in part fuelled by British colonialism and the influence of powerful economic interests in London attempting to keep a grip on the lucrative trade in nitrates. It vividly recounts the adventures at sea of Lewis’s great-great uncle yet also manages to skilfully interweave a narration of the social lives of poor farmers living around the Cardigan Bay area of Wales, the change and improvement in women’s rights and the complexities of Chilean politics at the turn of the century. This exciting debut from a highly promising author finds a happy counterpart in a new small independent publisher founded by the Chilean poet, activist and academic Consuelo Rivera Fuentes. 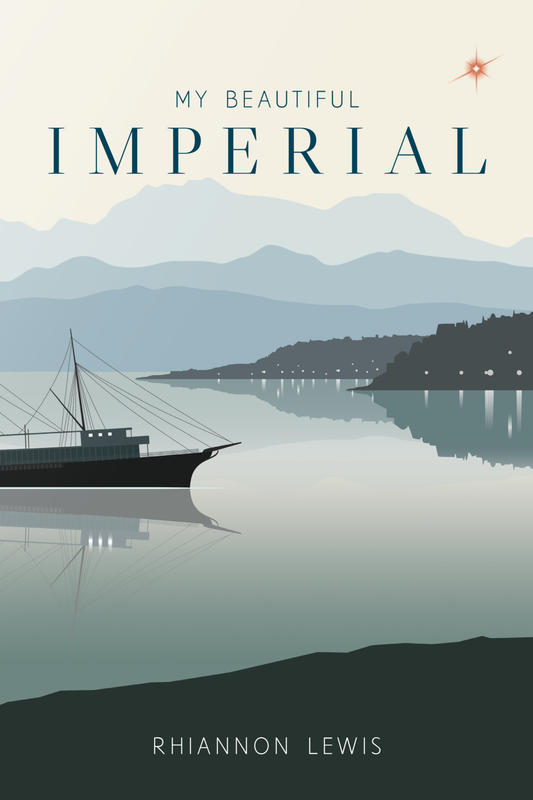 Rhiannon Lewis’s novel, ‘My Beautiful Imperial’, is a masterly mixture of grippingly suspenseful historical adventure and character study set amid the political upheaval of nineteenth-century Chile. It is admirably researched - but the facts are introduced tactfully and tastefully. We are swept along not just by the action but by the dialogue, which bristles right from the start - and more than anything else, by the central figure of Davy Davies, the Welsh sailor caught up in the Chilean revolution. Davies is an utterly memorable creation, erupting with believable life. (The image of him prancing around the room naked in a malaria-fuelled delirium will live long in the memory.) Davies’ doubts, foibles and passions become ours, and the innocence of his love affair with the unhappily married Estella is almost unbearably affecting, at times. But the secondary characters are almost equally vibrant, because Lewis has the enormous gift of summing up a person in a single, telling line: Estella’s husband, Laurence, for example, makes every caring remark sound like a rebuke. We ourselves genuinely care about Davies’ friends and colleagues and share his distaste his appallingly spiteful, embittered superior, Walker. In its ability to enthral us at every moment, ‘My Beautiful Imperial’ has the cohesive perfection of a great Hollywood movie like Casablanca. Indeed, the spontaneous singing of Welsh songs on board the Imperial as the ship faces possible annihilation is as poignant a scene, in its way, as the memorable moment the refugees burst into a chant of the Marseillaise in that legendary film. — Adam Feinstein, journalist and author of the acclaimed biography, 'Neruda'. The short story, At a Junction, came third in the Hammond House International Short Story Competition and was published in the anthology of winning stories, Eternal. The short story, The Significance of Swans, was shortlisted in the Bristol Prize and was published in the anthology of winning stories. Rhiannon Lewis’s ‘The Jugs Stay with the Dresser’ was the stand-out entry for me in this year’s Frome Festival Short Story Competition. A vivid, poignant story of a young wife in 60s rural Wales who finds her voice and discovers an unlikely ally along the way. Beautifully written with plenty of sweet to balance the bitter, it will stay with me for a long time. There are so many good descriptive passages that it was hard to pick a few as illustrations. This is a story brimming with good things all the way through. I love the ending which reverberates with hope. We don’t have too much to worry about as long as Oswald and Gabriel are still on the job.